I’ve already spent some time with Professor Hugh Davis, from Southampton, and we’ve had a number of discussions already around some of the matters we’re discussing today, including the issue when you make your slides available before a talk and people react to the content of the slides without having the context of the talk! (This is a much longer post for another time.) Hugh’s slides are available at http://www.slideshare.net/hcd99. As Hugh noted, this is a very timely topic but he’s planning to go through the slides at speed so I may not be able to capture all of it. He tweeted his slides earlier, as I noted, and his comment that he was going to be debunking things earned him a minor firestorm. But, to summarise, his answer to the questions is “not really, probably” but we’ll come back to this. For those who don’t know, Southampton is about 25,000 students, Russell Group and Top 20 in the UK, with a focus on engineering and oceanography. In this talk, Hugh’s planning to intro MOOCs, discuss the criticism, look at Higher Ed, ask why we are investing in MOOCs, what we can get out of it and then review the criticisms again. Hugh then defined what the term MOOC means: he defined it as a 10,000+, free and open registration, on-line course, where a course runs at a given time with a given cohort, without any guarantee of accreditation. (We may argue about this last bit later on.) MOOCs are getting shorter – with 4-6 weeks being the average for a MOOC, mostly due to fears of audience attrition over time. and then we went into the discussion of the stepped xMOOC with instructor led and a well-defined and assessable journey and the connectivist cMOOC where the network holds the knowledge and the learning comes from connections. Can we really actually truly separate MOOCs into such distinct categories? A lot of xMOOC forums show cMOOC characteristics and you have to wonder how much structure you can add to a cMOOC without it getting “x”-y. So what can we say about the definition of courses? How do we separate courses you can do any time from the cohort structure of the MOOC? The synchronicity of human collision is a very connectivisty idea which is embedded implicitly in every xMOOC because of the cohort. What do you share? Content or the whole course? In MOOCS, the whole experience is available to you rather than just bits and pieces. And students tend to dip in and out when they can, rather than just eating what is doled out, which suggests that they are engaging. There are a lot of providers, who I won’t list here, but many of them are doing pretty much the same thing. What makes a MOOC? Short videos, on-line papers, on-line activities, links toe external resources, discussions and off platform activity – but we can no longer depend upon students being physical campus students and thus we can’t guarantee that they share our (often privileged) access to resources such as published journals. So Southampton often offer précis of things that aren’t publicly available. Off platform is an issue for people who are purely on-line. If you have 13,000 people you can’t really offer to mark all their essays so assessment has to depend upon the self-motivated students and they have to want to understand what is going on – self evaluation and peer review have to be used. This is great, according to Hugh, because we will have a great opportunity to find out more about peer review than we ever have before. What are the criticisms? Well, they’re demographically pants – most of the students are UK (77%) and then a long way down US (2%), with some minor representation from everywhere else. This isn’t isolated to this MOOC. 70% of MOOC users come from the home country, regardless of where it’s run. Of course, we also know that the people who do MOOCs also tend to have degrees – roughly 70% from the MOOCS@Edinburgh2013 Report #1. These are serial learners (philomaths) who just love to learn things but don’t necessarily have the time or inclination (or resources) to go back to Uni. But for those who register, many don’t do anything, and those who do drop out at about 20% a week – more weeks, more drop-out. Why didn’t people continue? We’ll talk about this later. (See http://moocmoocher.wordpress.com) But is drop out a bad thing? We’ll comeback to this. Then we have the pedagogy, where we attempt to put learning design into our structure in order to achieve learning outcomes – but this isn’t leading edge pedagogy and there is no real interaction between educators and learners. There are many discussions, and they happen in volume, but this discussion is only over 10% of the community, with 1% making the leading and original contributions. 1% of 10-100,000 can be a big number compared to a standard class room. What about the current Higher Ed context – let’s look at “The Avalanche Report“. Basically, the education business is doomed!!! DOOOMED, I tell you! which is hardly surprising for a report that mostly originates from a publishing house who wants to be a financially successful disruptor. Our business model is going to collapse! We are going to have our Napster moment! Cats lying down with dogs! In the HE context, fees are going up faster than the value of degree (across most of the developed world, apparently). There is an increased demand for flexibility of study, especially for professional development, in the time that they have. The alternative educational providers are also cashing up and growing. With all of this in mind, on-line education should be a huge growing market and this is what the Avalanche report uses to argue that the old model is doomed. To survive, Unis will have to either globalise or specialise – no room in the middle. 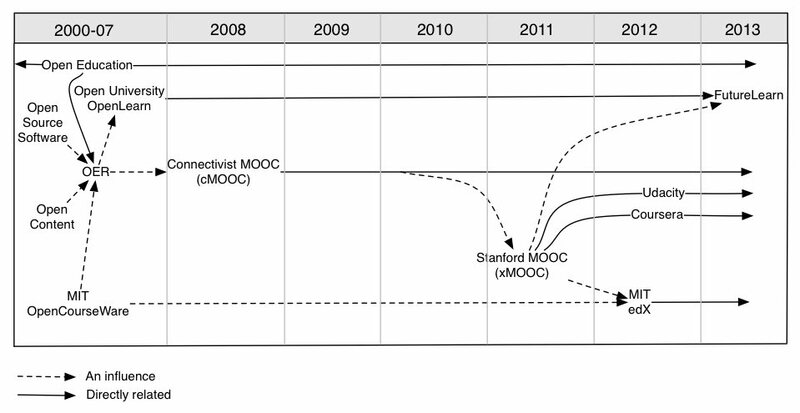 MOOCs appear to be the vanguard of the on-line program revolution, which explains why there is so much focus. Is this the end of the campus? It’s not the end of the pithy slogan, that’s for sure. So let’s look at business models. How do we make money on MOOCs? Freemium where there are free bits and value-added bits The value-adds can be statements of achievement or tutoring. There are also sponsored MOOCs where someone pays us to make a MOOC (for their purposes) or someone pays us to make a MOOC they want (that we can then use elsewhere.) Of course there’s also just the old “having access to student data” which is a very tasty dish for some providers. What does this mean to Southampton? Well it’s a kind of branding and advertising for Southampton to extend their reputation. It might also generate new markets, bring them in via Informal Learning, move to Non-Formal Learning, then up to the Modules of Formal Learning and then doing whole programmes under more Formal learning. Hugh thinks this is optimistic, not least because not many people have commodified their product into individual modules for starters. Hugh thinks it’s about 60,000 Pounds to make a MOOC, which is a lot of money, and so you need a good business model to justify dropping this wad of cash. But you can get 60K back from enough people with a small fee. Maybe on-line learning is another way to get students than the traditional UK “boarding school” degrees. But the biggest thing is when people accept on-line certification as this is when the product becomes valuable to the people who want the credentials. Dear to my heart, is of course that this also assists in the democratisation of education – which is a fantastic thing. What can we gain from MOOCs? Well, we can have a chunk of a running course for face-to-face students that runs as a MOOC and the paying students have benefited from interacting with the “free attendees” on the MOOC but we have managed to derive value from it. It also allows us to test things quickly and at scale, for rapid assessment of material quality and revision – it’s hard not to see the win-win here. This automatically drives the quality up as it’s for all of your customers, not just the scraps that you can feed to people who can’t afford to pay for it. Again, hooray for democratisation. Is this the End of the Lecture? Possibly, especially as we can use the MOOC for content and flip to use the face-to-face for much more valuable things. There are on-line degrees and there is a lot of money floating around looking for brands that they will go on-line (and by brand, we mean the University of X.) Venture capitalist, publishers and start-ups are sniffing around on-line so there’s a lot of temptation out there and a good brand will mean a lot to the right market. What about fusing this and articulating the degree programme, combining F2F modules. on-line, MOOC, and other aspects. Ah, the Georgia Tech On-line Masters in Computer Science has been mentioned. This was going to be a full MOOC with free and paying but it’s not fully open, for reasons that I need to put into another post. So it’s called a MOOC but it’s really an on-line course. You may or may not care about this – I do, but I’m in agreement with Hugh. The other thing about MOOC is that we are looking at big, big data sets where these massive cohorts can be used to study educational approaches and what happens when we change learning and assessment at the big scale. Pedagogically Simplistic! Really, as simple as a lecture? Is it worse – no, not really and we have space to innovate! No support and feedback! There could be, we’d just have to pay for it. Poor completion rates! Retention is not the aim, satisfaction is. We are not dealing with paying students. No accreditation! There could be but, again, you’d have to pay for someone to mark and accredit. This is going to kill Universities! Hugh doesn’t think so but we’ll had to get a bit nimble. So only those who are not agile and responsive to new business models may have problems – and we may have to do some unbundling. The patterns of engagement were identified as auditing, completing and sampling, from the Coursera “Emerging Student Pattersn in Open-Enrollment MOOCs”. Is it the end of the campus? … No, not really, Hugh thinks that the campus will keep going and there’ll just be more on-line learning. You don’t stop going to see good music because you’ve got a recording, for example. And now for the conclusions! MOOCs are a great marketing device and have a good reach for people who were out of reach before, But we can take high quality content and re-embed back into blended learning, use it to drive teaching practice change, get some big data and building capacity for online learning. This may be the vanguard of on-line disruption but if we’re ready for it, we can live for it! Well, that was a great talk but goodness, does Hugh speak quickly! Have a look at his slides in the context of this because I think he’s balanced an optimistic view of the benefits with a sufficient cynical eye on the weasels who would have us do this for their own purposes.